The Manzana Jesuitica, or the Jesuit Block, as it is called in English, is Cordoba’s Unesco world heritage site. It houses the university of Cordoba. You can go inside to see a history museum, but to fully appreciate the building and its history, I recommend taking a guided tour. Our guide took us to some of the university’s collections, opened locked doors for us and explained about both Cordoba’s and the university’s history. Tours are available in both Spanish and English and times are posted next to the entrance door. The Jesuit Church, or Iglesia de la Compania de Jesus, as it is called in Spanish, is another part of the Jesuit block. It used to consist of a main building and two chapels, but these days, only one chapel remains. The other one is now part of the University of Cordoba. 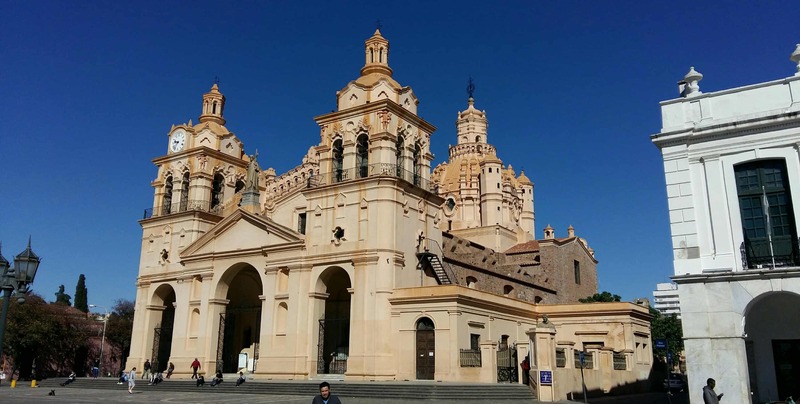 The church dates from the 17th century and construction took only about thirty years – pretty quick if you consider that building Cordoba’s cathedral took two hundred years. Once inside the church, make sure to look up. The ceiling was constructed with wood from Paraguay, which is lighter than the wood in the area around Cordoba. Free walking tours are a great way to discover a new city. You get to orient yourself and you learn lots of interesting facts about the city. Plus, our guide in Cordoba gave us a great recommendation for the best choripan in the city. Free walking tours are based on tips so you give as much as you can afford and as you think your guide deserves. The one in Cordoba leaves from the central plaza, the Plaza San Martin, at 11am (as of October 2017) and takes in most sights of the historic city centre. I just mentioned that my guide from the free walking tour told us about the city’s best choripan and I want to share this recommendation with you. Inside Parque Sarmiento, you will find a roundabout with the statue of Dante Aliguieri. The choripan sold here is supposed to be the best and I have to say, it was pretty good. 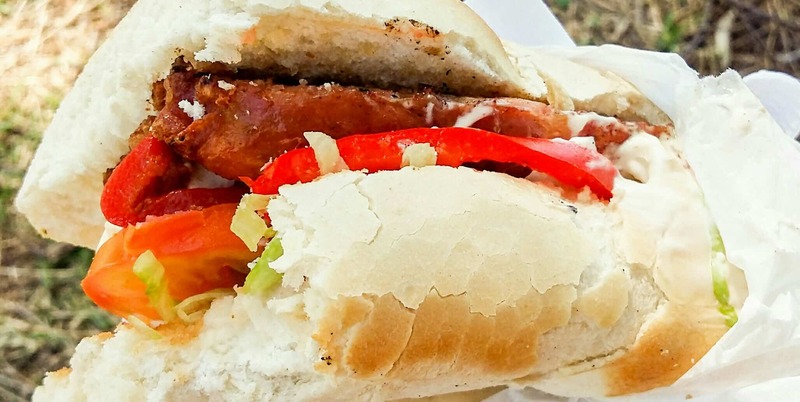 If you’re wondering what choripan is, it is a sandwich with chorizo. The sausage has been cut open to make it easier to eat and you can add all kinds of vegetables and sauces. It makes for a perfect lunch. This museum is located in a white colonial house close to the Plaza San Martin. The building is the only one left from this time period in Cordoba and it once belonged to Rafael de Sobremonte. He became viceroy and moved to Buenos Aires. When the city got invaded by the British, Rafael de Sobremonte took the royal treasure and fled to Cordoba. These days, he is regarded as a coward by the inhabitants of Buenos Aires and as a hero by the people living in Cordoba. While the museum does not show the royal treasure that he saved, it is a great example of colonial architecture and houses many objects from that time period. If you want to go out in the evening, head to Nueva Cordoba. Along Belgrano street, you will find many bars and get the chance to listen to live music. Since this is where most students go out, prices are acceptable and you can have a great night out, hopping from bar to bar. The Cathedral, located at Plaza San Martin, is the oldest church in continuous service in Argentina. Its construction took two hundred years, mainly due to a lack of qualified builders. The interior is beautifully decorated and well worth taking a look at. The Museo de la Memoria is the one thing I couldn’t see in Cordoba that I wish I had been able to visit. It is located close to Plaza San Martin and was, during the last military regime, used as a detention centre for political opponents. On the outside walls, you will find the names of all the missing people whose bodies have never been found. Unfortunately, the museum is closed on weekends but if you’re in Cordoba on a weekday, make sure to check it out.